Arunachal Pradesh is known as the Land of Rising Sun, it is celebrated for its natural beauty. This Indian state has a great cultural background over the ages. Arunachal Pradesh rivers are Subansiri, Lohit, Dihang and Kameng. Ethnic groups of Arunachal pradesh are Monpa, Nyishi, Mishmi, Khatmi, Tangsa, hruso, galo, miju mish. Arunachal pradesh has rich heritage of Tawang Moonastery built in 17th Centure for buddisht monks which is 113 feet long and 80 feet width. The rich culture of the Arunachal Pradesh state gets its vivid colors from the handicrafts that reveal the craftsmanship of ethnic group artisans. The Buddhist tribe specializes in making amazing masks. Arunachal Pradesh has 12 tourist circuits across 83,500 sq. Km. Arunachal is jam-packed with things to do. Each tourist circuit is distinctive in character with different ethnic culture, topography and vegetation, The hardest part of planning your holiday will be deciding which to do first! As per the Aadhar Statistics the Arunachal Pradesh population in 2019 is 1,528,296 (1.53 Millions) as compared to last census 2011 is 1,382,611. 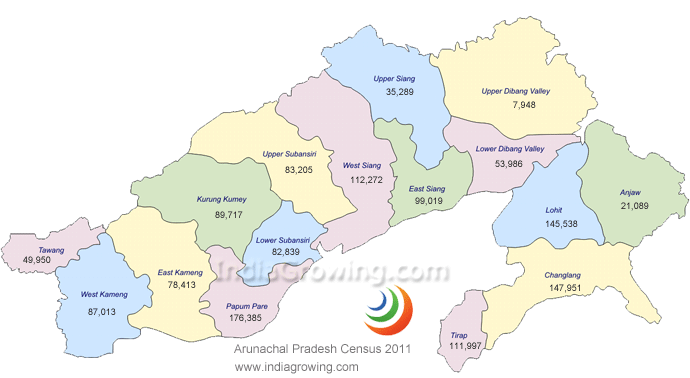 Growth rate of 10.54 percent of population increased from year 2011 in Arunachal Pradesh. till 2018. Arunachal Pradesh is the north-eastern state of india with 16 districts as per census 2011, New 9 districts are formed with a total of 25 districts as on January 2019. The Largest district is Upper Dibang Valley with an area of 9,129 sq km. Population wise Papum Pare is the largest with 176,385 persons living in this district. Universities: The universities of Arunachal pradesh are North Eastern Regional Institute of Science & Technology(Itanagar), Rajiv Gandhi University(Itanagar), Venkateshwara Open University, North East Frontier Technical University(West Siang), Indira Gandhi Technological and Medical Science University(Ziro).